Ah, here we go... 10th comic, and in a week it'll be exactly two months since the comic's launch. It's been a wonderful ride so far, wouldn't you agree? This page was one of those pages. I came very close to having to start over because I screwed up on the modifications I had to make to the lineart to get the logo on that bloody store window. A lesson for all of you: Keep a backup of your lineart before you start fiddling with it! 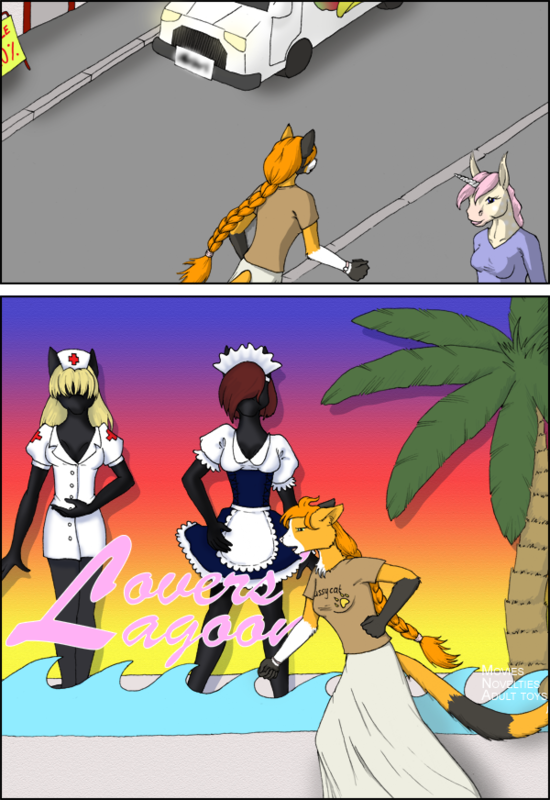 The unicorn lady in the first panel is based on a character my best friend used on an online forum forever and a day ago. Since it was so long ago (and she's not really furry otherwise) I've no clue if I actually got the colors right according to the original design. Be that as it may, I can still dedicate the appearance here to her.